Above - A Google StreetView Image of the site of Green's Playhouse today - The Tower which survived the fire in August 1995 is all that remains, the rest of the building is a replacement Bingo Hall - Click to Interact. Opening on the 4th of March 1936 in the Nethergate the huge and luxurious Art Deco styled Green's Playhouse was designed by the Green's favourite architect John Fairweather. It shared the same quality and finishings of the Queen Mary then being built at Clydebank. Its stalls auditorium was regarded as being the largest in Europe and the total seating for 4,123 patrons was only 100 short of the Glasgow Green's Playhouse total  the largest cinema ever built in Europe. Right - A report on the imminent opening of Green's Playhouse, Dundee - From the Evening Telegraph, 3rd March 1936. The Evening Telegraph reported on the new Playhouse the day before it opened in their 3rd of March 1936 edition saying:- Green's New Playhouse, Nethergate Dundee Opens Tomorrow Afternoon - First impressions on viewing the interior of the Playhouse are of amazement that such a compact building should contain the tremendous number of 4100 seats. Short of conscientiously counting each and every fauteil, one would almost doubt that the capacity was so great; but it is vouched for, not only by George Green, Ltd., but by the city officials' reports to the Works Committee. Immediately the question arises, "How did they get them in?" Going on the analogy of the old saying that you can't get a quart into a pint pot, one would imagine that for such accommodation a building of tremendous, vastness was necessary. Yet the Playhouse interior is far from overpowering in its vastness. The only comparable building in Dundee in point of seating accommodation - the Caird Hall, with 3300 seats - gives a far greater impression of distant immensity. The Playhouse is almost intimate in comparison with the Caird Hall, and yet it seats 800 more people. The secret, of course is proportion. There are no faraway recesses about the Playhouse. At the back of the balcony or the stalls one is still at reasonable distance from the screen, and the banks of seats are so arranged that there is an uninterrupted view for every part of the house. 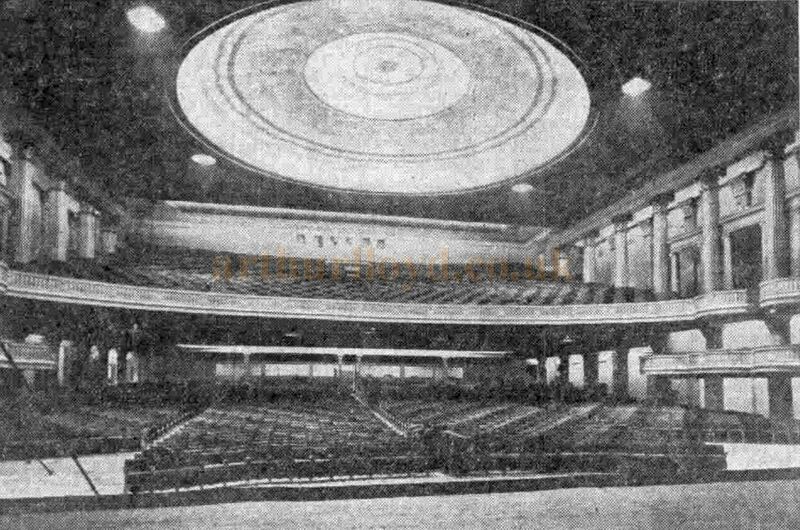 Above - The Auditorium of Green's Playhouse, Dundee - From the Evening Telegraph, 3rd of March 1936. ...The central dome in an outstanding feature, architecturally and visually, of the interior of the Playhouse. This magnificent circular ceiling, gracefully curving in a shallow upturned bowl, is 60 feet in diameter, and is cunningly finished in indeterminate shades of silver and gold, encircled by broad wavy bands of strongly contrasting colour, which make it an ideal playground for the blends of light proceeding from the concealed fittings round the outer circumference. A lovely scalloped design in the centre enhances its beauty. Above the entrance in Nethergate there has been erected a tower of cream tinted cement, the front part of which is a pylon of steel, concrete, and glass construction rising to a height of 85 feet. This supports a projecting sign, on which the name "Green's Playhouse," is spelled out in illuminated neon letters. The framework between the tower and the sign is glazed with panels illuminated from behind. Entering from Nethergate, the patron passes through a vestibule with pay-boxes in the centre flanked on either side with show-cases of modern design in which forthcoming attractions will be displayed. Shades of green and red are used in the terrazzo flooring, but the walls are plain, (depending for effect on floodlighting and neon tubing. Just beyond the vestibule is an auxiliary entrance which gives immediate access to the foyer from Yeaman Shore, and which will thus be very convenient for patrons coming from the direction of West Station. In this vicinity, too, a free cloakroom and a telephone booth are provided. 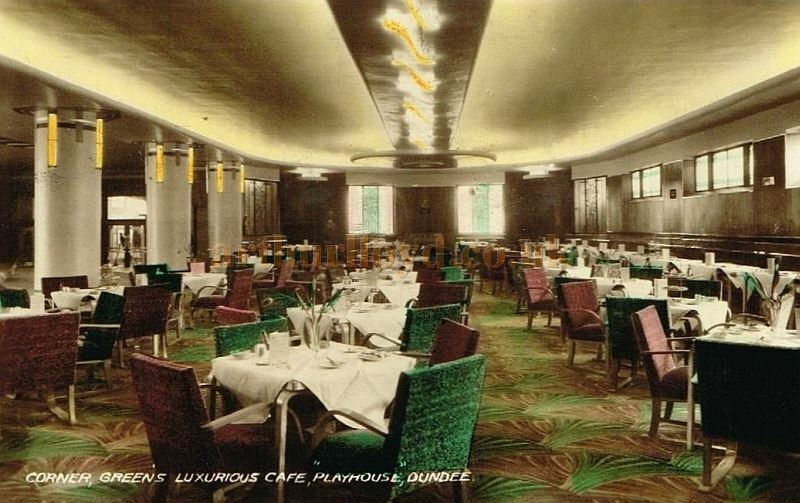 Above - An early Postcard showing the cafe at Green's Playhouse, Dundee - Courtesy Tom McDonald. ...To the left of the foyer, and separated from it by a row of massive columns, is a cosy and attractive tea room. It should be emphasised that one does not pass through the tea room to enter the cinema. A feature of the tea room is the hard-wood floor, suitable for dancing, which is surrounded by contrasting lines of walnut and birch, with a corresponding design in the centre. Round the floor runs a raised dais or terrace, with settees upholstered in green and pink, and the decoration consists of plaster troughs illuminated by concealed amber lighting. The whole has a bold, modern tendency which is very effective. Returning to the foyer, the approach to the balcony is by way of an imposing white marble stairway, flanked by mirror, and glass panels illuminated by neon tubing. Overhead is suspended a trough with concealed lighting, and the frieze is carried out in fluted cream plaster. Facing the top of the main stairway is a large semi-circular display recess, like a miniature stage, where tableaux advertising coming attractions may be featured. The distribution of the seating, by the way, is 1550 in the balcony and over 2500 downstairs. Right - Details of the contractors and suppliers responsible for the creation of Green's Playhouse, Dundee - From the Evening Telegraph, March 3rd 1936. The interior architecture is mainly on classic lines, ornate and yet in some respects austere. The capitals of the composite columns which flank the auditorium are softly illuminated by concealed lighting in three colours, and over the back balcony there is suspended an immense lighting trough, 84 feet in length. The ceiling over the back balcony is further illuminated by concealed lighting at the level of the main ceiling. There are two boxes on either side at the balcony level and three on either side below - from all of which a perfect view of the screen may be obtained. They are furnished with richly-upholstered twin settees. The first six rows of balcony seats are divans deluxe upholstered in two shades of gold. The upholstery throughout the theatre, in its radiating lines of pink, amber, red and gold, is of the richest character, with fully sprung seats and sponge rubber arm-rest. The passages are illuminated by glass panels let into the seats at the end of each row, and these are under the control of the usher. The floor is covered with a luxurious carpet with the slogan - "It's Green's; it's good" woven into the pattern. The panels between the columns on either wall are decorated with a frieze of classical figures in keeping with the architecture. The huge and lofty proscenium is flanked with fluted Ionic columns of noble dimensions, and on either side are plaster grilles with provision for an organ chamber. The proscenium is 65 feet wide, and the stage itself. 27 feet deep, is completely equipped for theatrical productions. The grid (or "floor" above the stage) is 85 feet wide, and modern counterweight sets have been installed to fly the screen and sound equipment so that the stage may be speedily cleared. 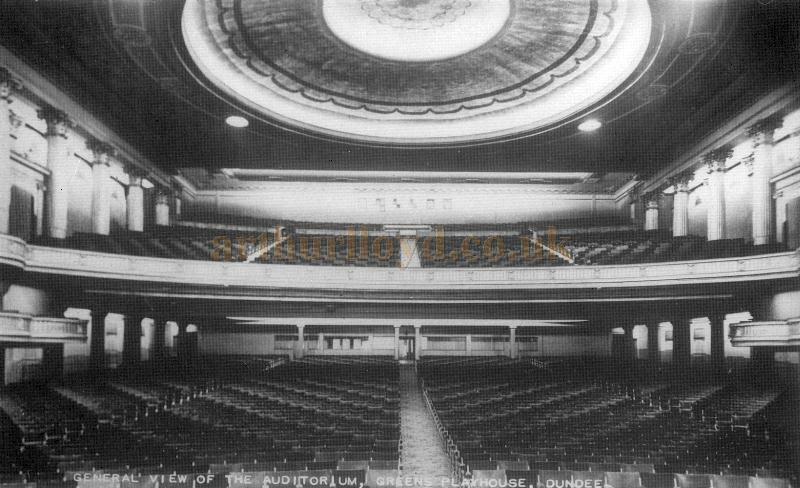 Above - A Postcard showing Dundee's Green's Playhouse auditorium of 1936 - Courtesy Graeme Smith. The seating of the stalls has been arranged in four blocks, curved so that spectators in each of them are at a true and comfortable angle to the screen. A welcome feature is the absence of pillars, the main support of the balcony being a 30-ton girder spanning the full width of the theatre. There are, it is true, four comparatively small pillars near the back of the stalls, but they are so placed as not to obstruct the vision of a single patron. At first sight, seeing a seat directly behind one of these pillars, one is inclined to think that a mistake has been made for which some member of the audience is bound to suffer. Sitting in the seat, however, one finds that, owing to the angle at which the seats are set, there is a complete view of the stage uninterrupted by the pillar. Behind the stalls, which are entered by a stairway to the right of the marble staircase, there is a waiting hall to accommodate about 300 people. The auditorium is divided from the rear passage by a glazed screen which serves the double purpose of excluding noise and possible draughts from the entrance. Particular attention has been paid to the decoration of the ceiling over the rear part of the stalls, so as to give an effect comparable with that enjoyed by patrons in the balcony. Concealed lighting in four colours is fitted, blending in harmony with the rest of the theatre lighting. In a building of such capacity the question of exits is of special importance, and these have been provided in excess of the requirements of the law and the local authority. There are eleven exits from the stalls alone, and six from the balcony. The operating suite has two exits of its own independent of the auditorium. 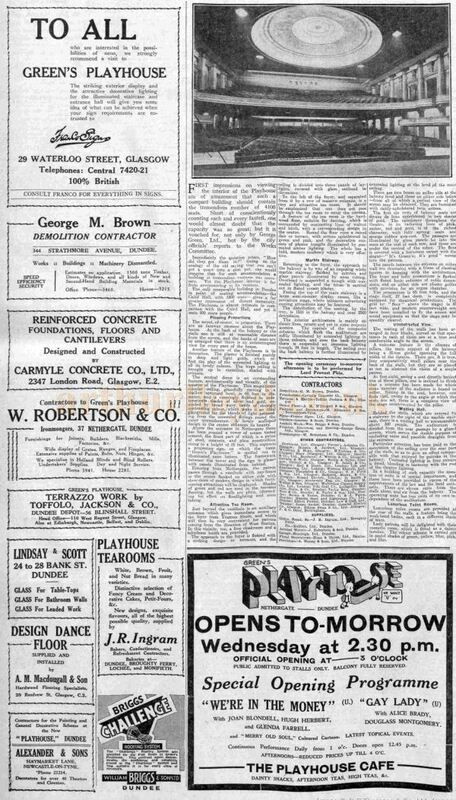 The above text in quotes was first published in the Evening Telegraph, March 3rd 1936. While concentrating on film the Theatre also presented live performances from time to time, it being fully equipped for theatrical productions. The proscenium was 65 feet wide and the grid was 85 feet wide with full counterweight sets which could fly the screen and speakers. 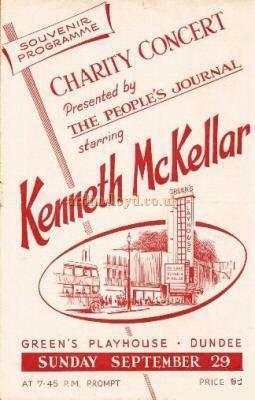 Right - A Flyer for a Kenneth McKellar Concert at Dundee Green's Playhouse - Courtesy of Colin Calder. In 1968 it became a Mecca bingo hall; and after a fire in August 1995, and rebuilding, for Bingo, only the tower remains of Green's Playhouse today. 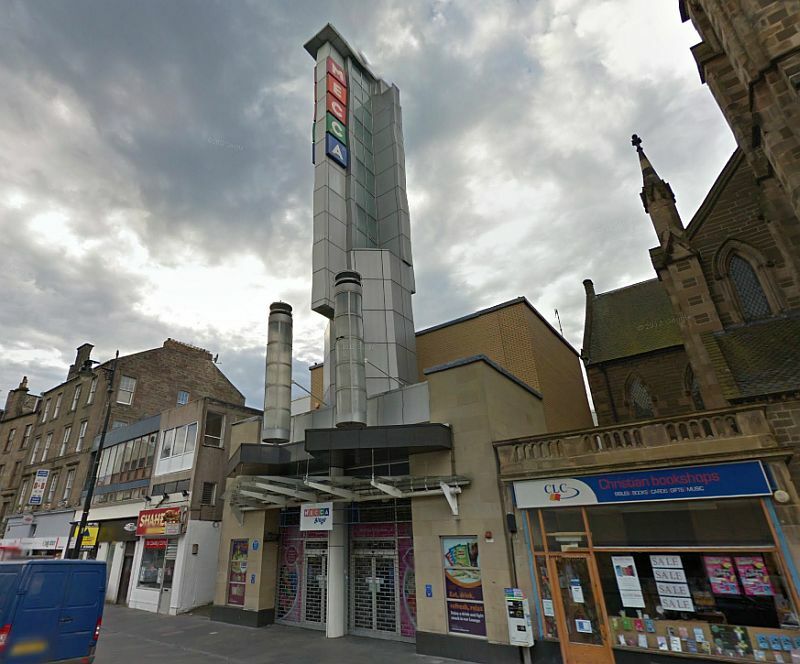 There are some very good photographs of the original building and later changes on the Scotish Cinemas Website here. The above article on Green's Playhouse, Dundee was first written for this site by Graeme Smith in February 2013, additions by M.L. were added in 2019.